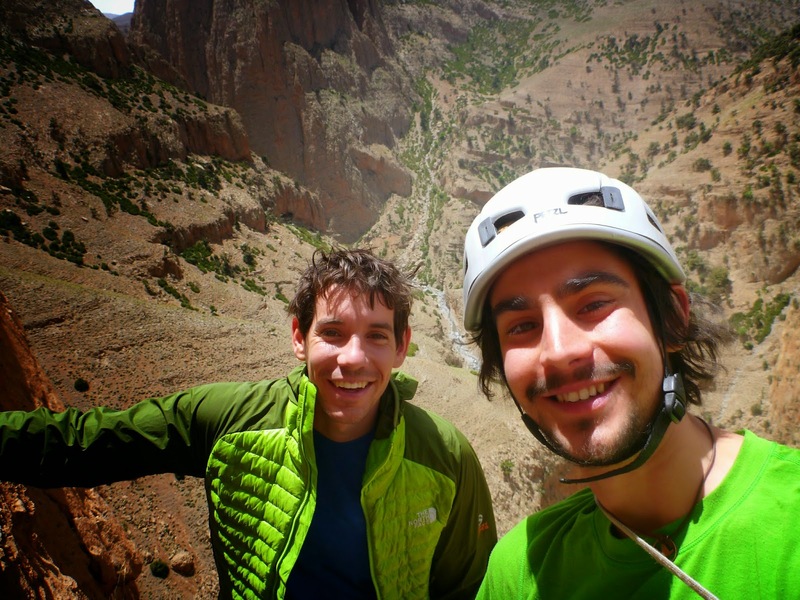 Morocco Taghia - Part 2: The Climbing! Walking up to Taghia it's impossible not to be inspired (and slightly intimidated) by the big limestone walls rising steeply up from water worn gorges behind the village. I couldn't wait to start climbing. I was very impressed with the consistently high quality of the climbing on almost all the routes I climbed in Taghia. Usually when climbing long routes in the mountains it's accepted that the quality of the rock and climbing will be less then on our favourite single pitch crag, I was presently surprised that this was not the case in Taghia; I would not hesitate to describe the routes I did in Taghia as some of the best single pitches of climbing I've ever done stacked on top of each other to make pitch-after-pitch of great climbing. The style in Taghia is often wall climbing on crimps but there are also some tufa sections and plenty of slabs and roofs to mix things up. 2nd May: Le rêve d'Aïcha 6a+ 255m Timghazine, Paroi des Sources - Nice 'short' warm up with short approach, climbed in the afternoon after arriving in Taghia. 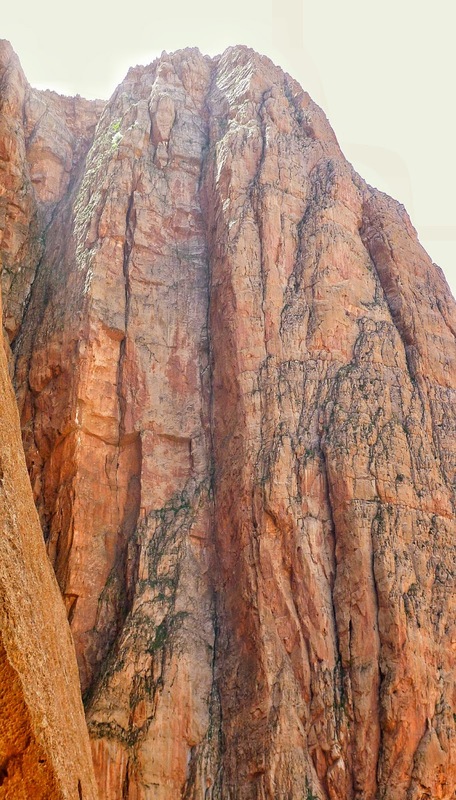 Awesome couple of easy corner crack climbing pitches. 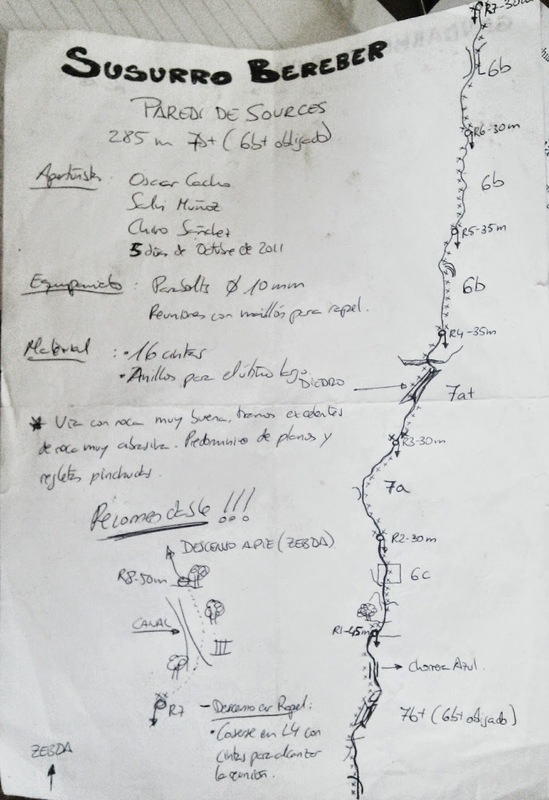 5th May: La Trufa 7a 20m, Dive Master 7c 26m. 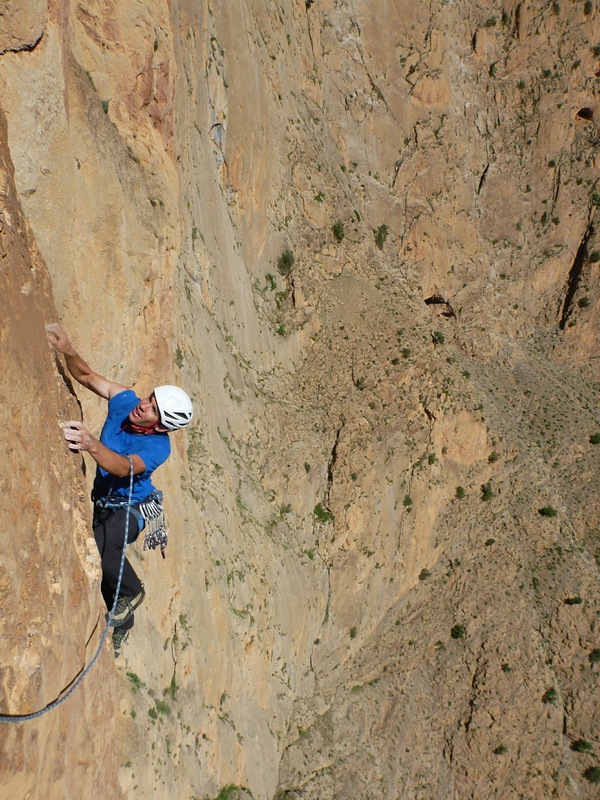 Les Colonnettes De Tamdarote - Stunning couple of routes on steep single pitch tufa crag. But of long and strenuous walk up a scree slope to get to, but worth it. The crag actually faces East instead of West as the guidebook indicates. The three routes on the crag are all good and apparently the grades of the routes (left to right) are more like 8a, 7c, 7a instead of 8a+, 7b+, 7a as printed in the guide book. 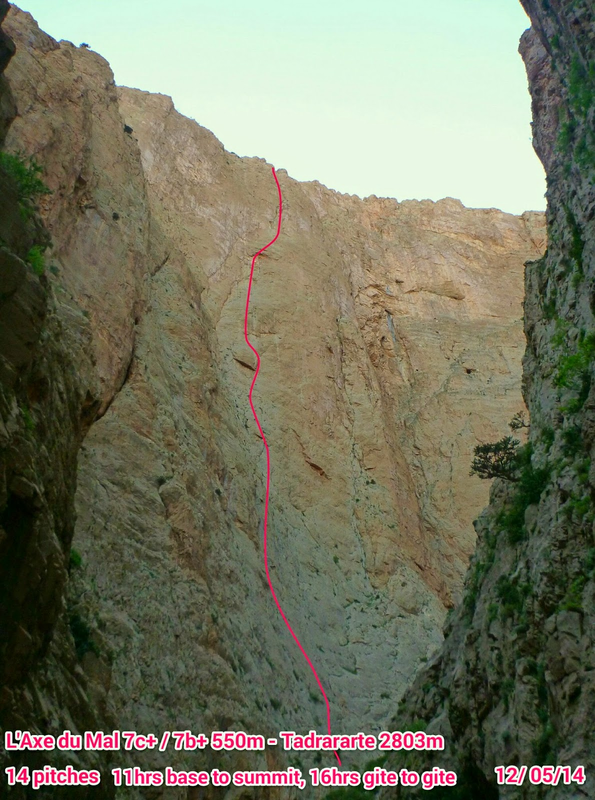 4th May: A borie ou je tue le chien 6c 250m Taoujdad SW face 3171m - Fantastic crimpey wall climbing with nice exposure. Bit of a long walk in but worth it to top out on a proper summit. 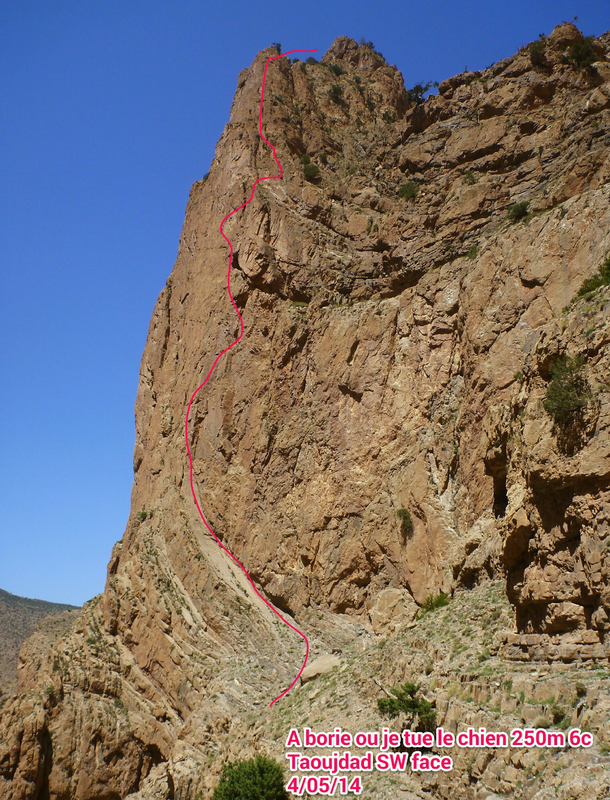 6th May: Susurro Berber 7b+ 285m, Paroi des Sources. 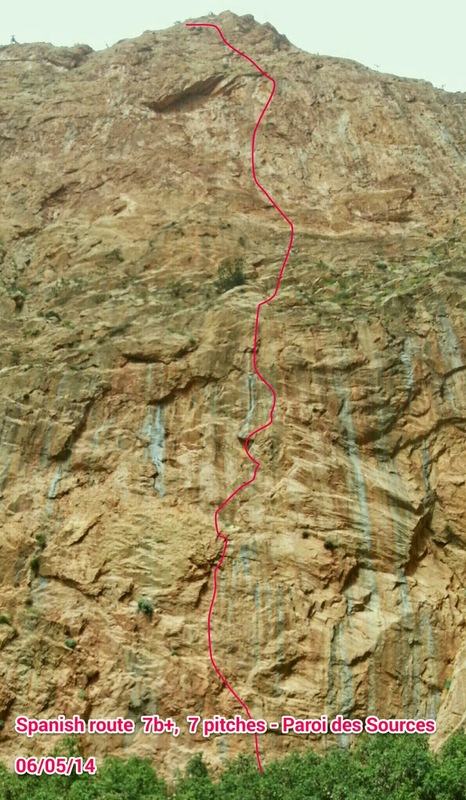 7 pitches (7b+, 6c, 7a, 7a+, 6b, 6b, 6b) . First pitch was hard and long, and good. Could almost be 7c I think. Probably the hardest I've on-sighted pre 9am! Lots of awesome pitches, might be better then Zebda. 7th May: Shucran 380m 7b+, Oujdad Face Ouest. Good route but a little sharp on the fingers in places. Route could be better bolted, quite a few of the pitches are short and can be ran together. Top belay is missing hangers, backed up with a sling. Speedy ascent climbing with Alex Honald, 3.5hrs to the top, did 12 pitches in 4! Great climbing, super technical, always interesting and varied, lots of traversing. We abseiled the route as going all the way to the summit would be quite a long scramble from the top of the route. 8th May: Libiti Bito 7b, Timghazine, Infrig, Paroi Du Haut. 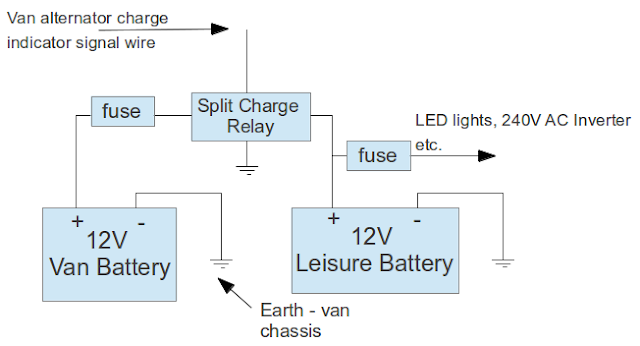 Loose, dirty and run out in places. Obviously does not get climbed often. Bailed after 7b roof pitch (4 pitches up) which I probably more like 7c in the routes current (very dirty) state. We abbed of then I had to do free hanging prussic 20m back up to free rope from crab I accidentally left to hold me in to the wall on abb, I forgot we were climbing on doubles joined with knot for abbing...oops. 10 May: Fantasia 600m 7c. 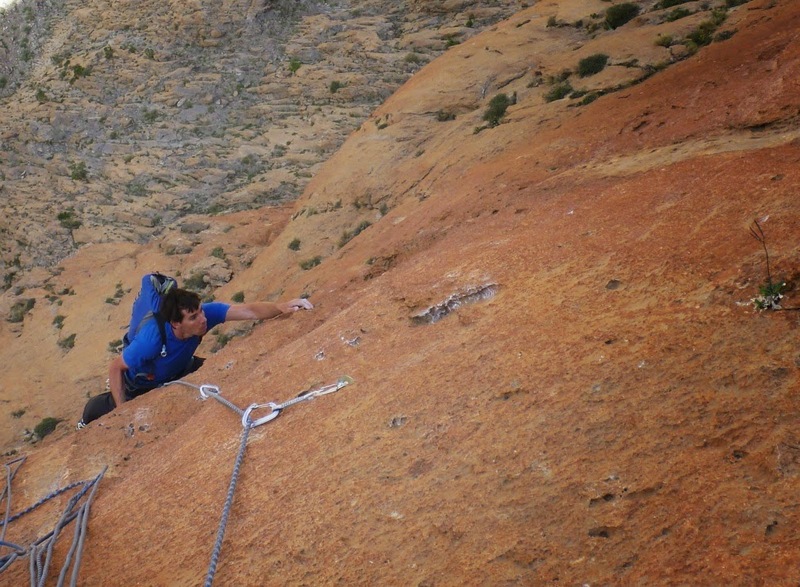 Another day out with Alex Honnold. 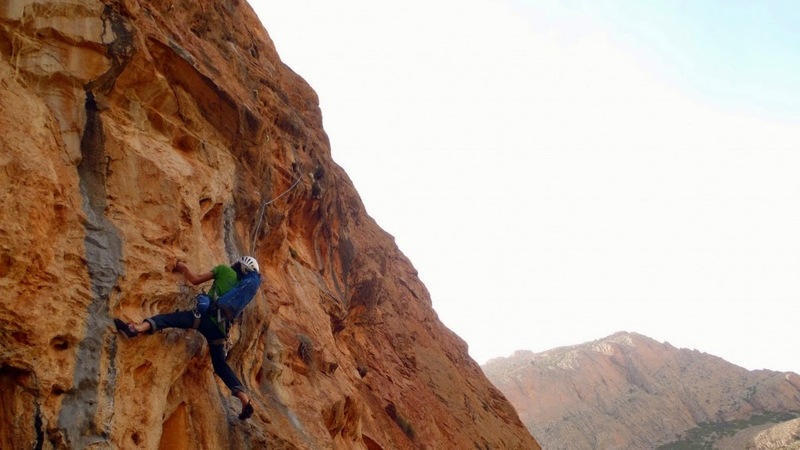 Awesome route, stunning climbing. Pitch 3 (7b+ 'cheese') pitch is probably the crux; savage crimping on edges, hard to read if not chalked. I climbed again with Alex Honald, moving quickly with managed 7.5hrs base of route to summit. We topped out and walked out, quite a lot of jungle bashing easy scrambling to get to the summit from top of the route. 11hr round trip from gite to gite. Quite a long day out. I fell once on lead on 7a after linking it together after 7b+, I was bit tired and rushing with rope drag. Also came off seconding bottom of top 7c pitch when foot slipped. tenuous climbing in places. Alex also joined us close by, having a day out 'scrambling' by himself. 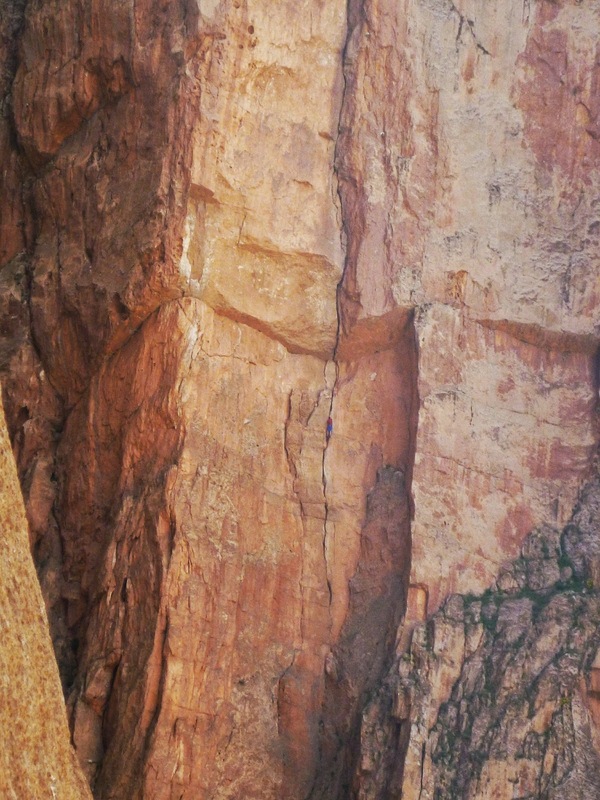 It was very impressive and slightly scary watching him make the first on-sight solo ascent of Rouge Berbere a 500m 7b hand jamming crack on the wall adjacent to L'Axe du Mal. Alex cruised the route in 2.5hrs stopping only a couple of times to sit down, take off his shoes and wave to us. 12th May: L'Axe du Mal 7c+ 500m, - Tadrararte. Fantastic route up a stunning big remote wall, felt like a good adventure. The climbing was all good and quiet varied, generally face climbing with a number of (hard) slab pitches and one roof pitch. I found the 7b+ slab to the the crux and I aided through the 7c+ three bolt bolder problem up high since we were pretty tired by this point. Total 16-17hr day gite to gite! 11hrs on the route from base to summit. We were a little slow in the upper sections since there are lots of hard pitches. In the couple of weeks I was in Taghia I added up the total vertical climbing we did was 2510m. No wonder my climbing shoes which were new at the start of the trip are now rather worn and my feet ached walking around Marakesh on the journey home! 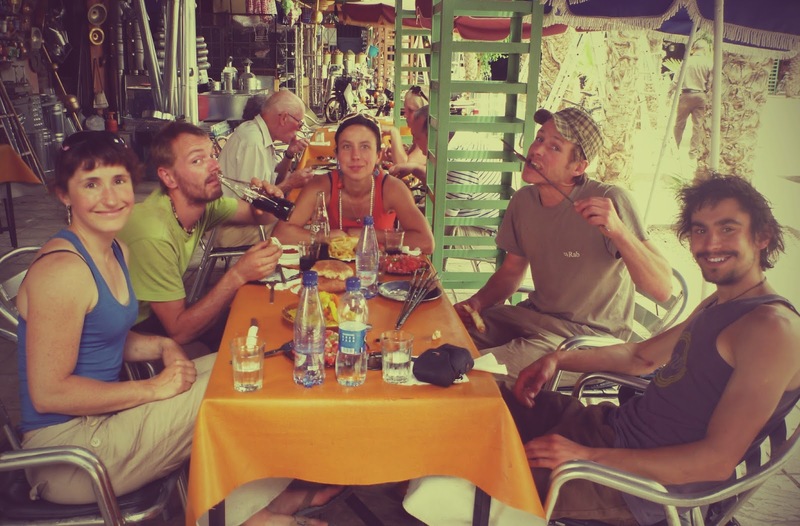 Thanks to Sophie, the South African Crew (Clinton and Gosia,), Alex (Honnold), the tough boys from Netherlands ( Ka, and Hja), the French crew with Anaud Petit and everyone else for an amazing unforgettable trip. 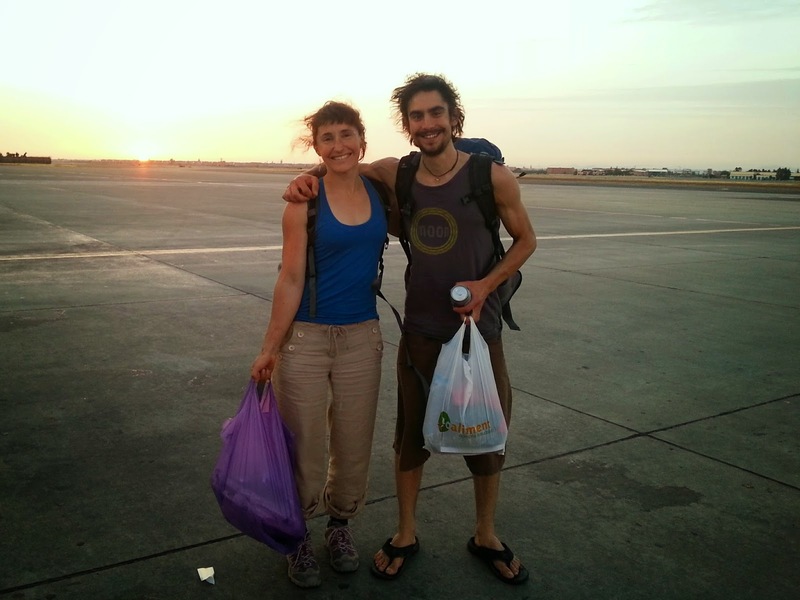 Sophie and I about to board plane home in Marrakesh with first beer for two weeks in hand! 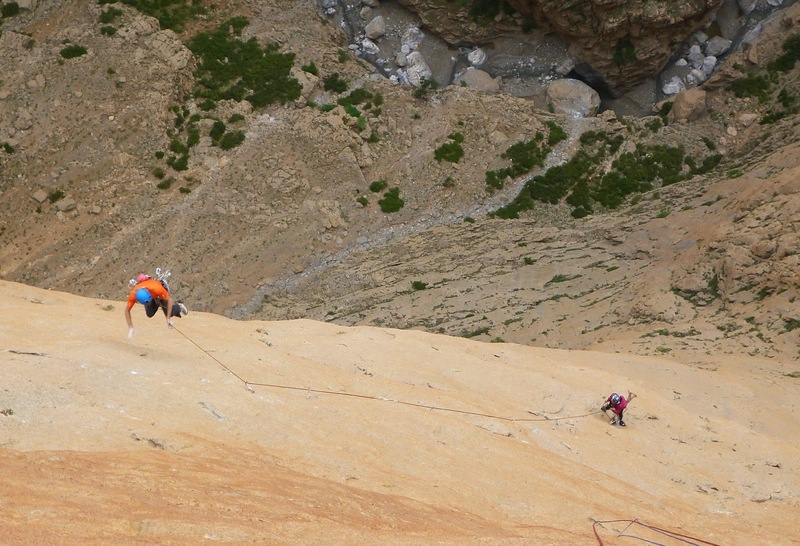 Taghia is a beautiful place known worldwide by the art of climbing. Located in the Moroccan High Atlas, province of Azilal. It is encircled by colossal and majestic mountains whose height varies between 400 and 800 m. In a way it is a fabulous and paradisiac space to take full advantage of climbing activity in limestone rock of good quality. 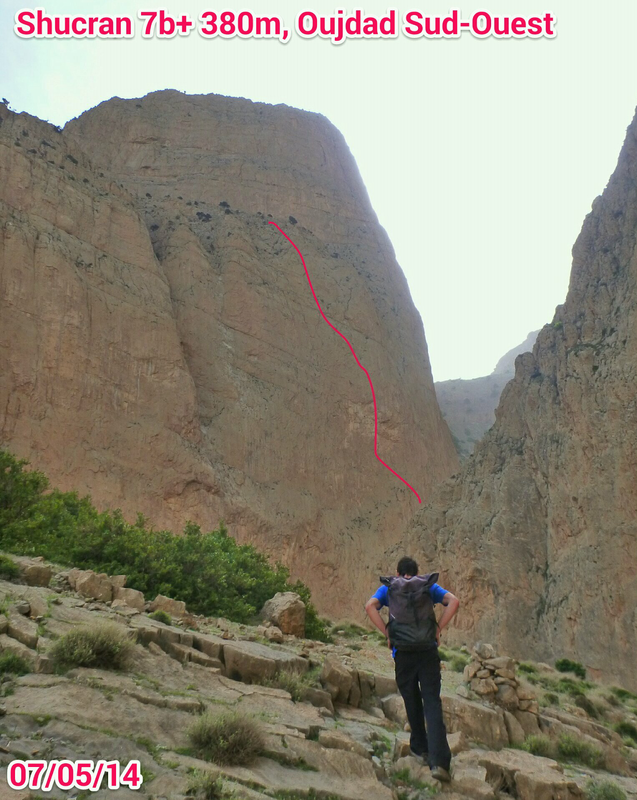 The multiplicity of its tracks in different rating offers to the lovers of the climb the possibility of access to all the ways, among other easy and difficult ways for beginners and experts. 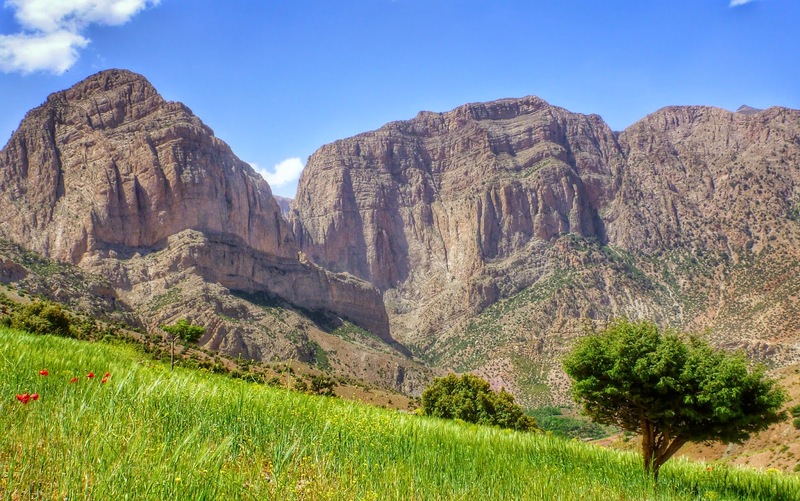 Taghia is also the main point to discover the Moroccan High Atlas as: the Ait Bougumez valley, the summit of M'goun, Imilchil, the Cathedral, Anergy also the gorges of Dades and Todra. To get there do not hesitate to contact Rezki Mohamed native of the place, it can take care of your trip from Marrakech to Taghia and from Taghia to Marrakeche (hotel in Marrakech, transport, mules, lodging, Mountain hiking ). With reasonable prices. CONTACT : [email protected] : phone number is 00212632382762. Always works thanks to the Meditel network. 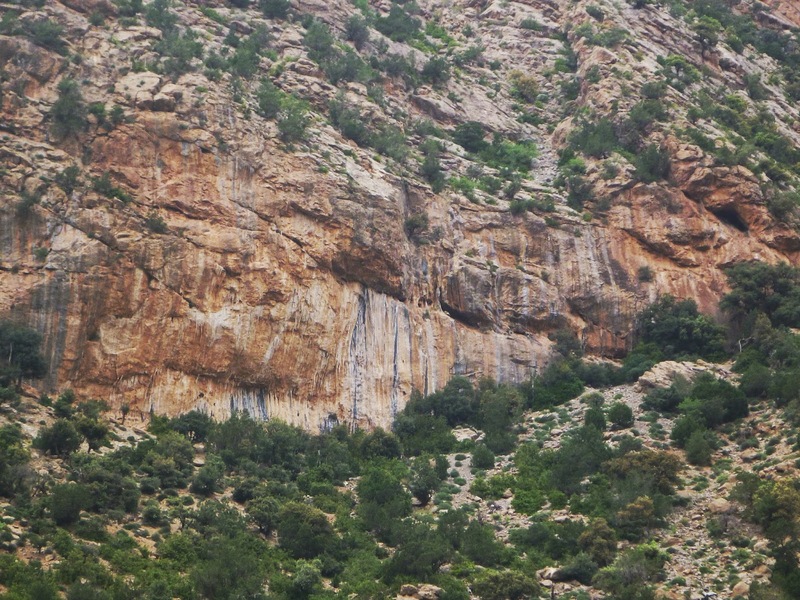 Today Cathy shares with us her experience and tips for visiting Taghia Gorge, Morocco. 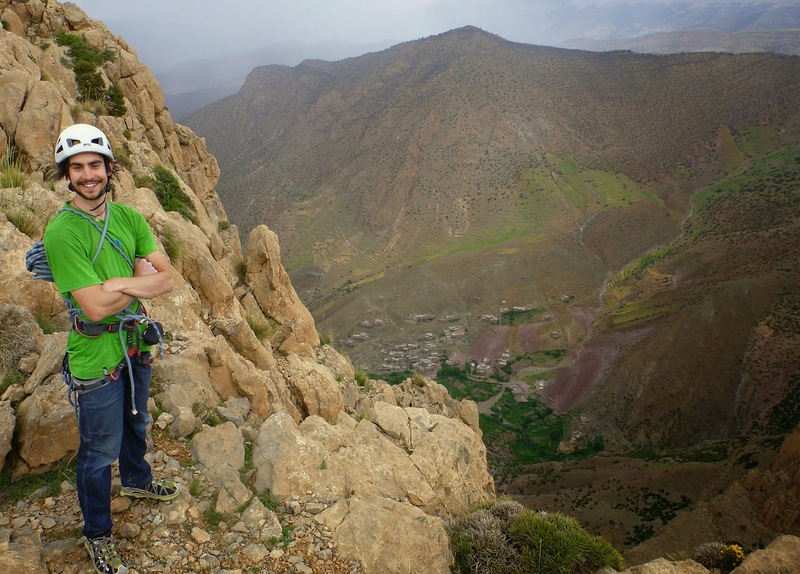 Climbing in the Taghia Gorge, located in the high Atlas mountains of Morocco, is like climbing through a time machine, where the towering limestone walls protect the small village from the conveniences of this modern life. 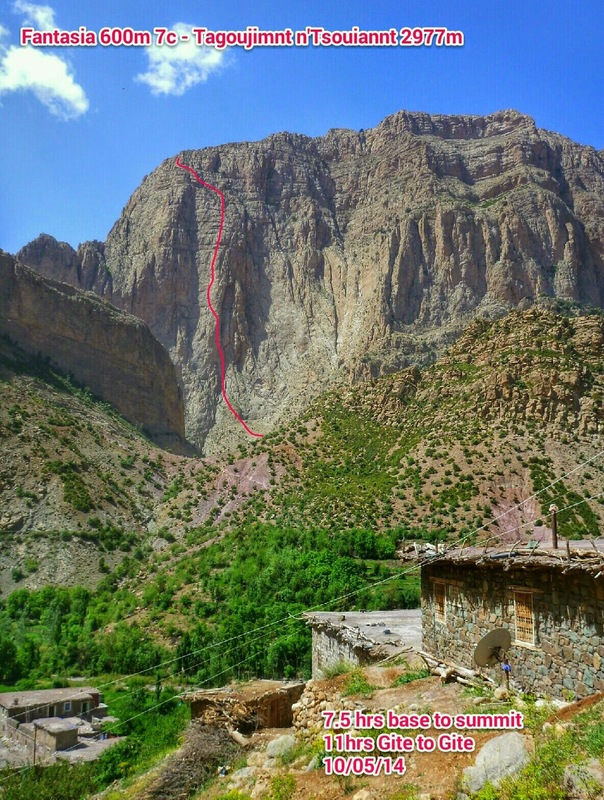 Climbing here began in 1974, with the establishment of the route Shoukran (5.12) by Tony Arbones. Further development, including many highlights from Arnaud Petit, leaves Taghia with 250+ routes, and endless potential for development. How to get there: Flights are available from many European cities directly to Marrakesch. From there you’ll need to get to Zaouia Ahanesal either by public transit (via the town Azilal) or if you have less time and are willing to pay extra, you can travel directly with a taxi at a cost of ~120 euro/taxi (2014). To get from Zaouia Ahanesal to Taghia is ~2h walking trail. When we arrived, Ahmed (the son of Saïd) met us in Zaouia Ahanesal and walked with us into the gorge. Donkeys can also be rented for 9 euro donkey to help carry gear. Once you’ve reached Taghia climbing is a short walk away. Aventura verticale Taghia au Maroc est l' un des sites d' escalade incountournable au monde , connu par le charme des calcaires pour y faire de l' escalade et la Randonnée . Ce beau coin au monde occupe le coeur de haut atlas Marocain , village berbère isolé dans le fond des montagnes de la chaine Atlas . Pour s'y rendre vous pouvez contacter Chez Ahmed à Taghia . Il s' occupe de tout le corps de votre voyage :Réservation de Gîte à Taghia et Transportde Marrakech à zaouiat Ahansal , et les mules pour le bagage 2h de marche à Taghia. 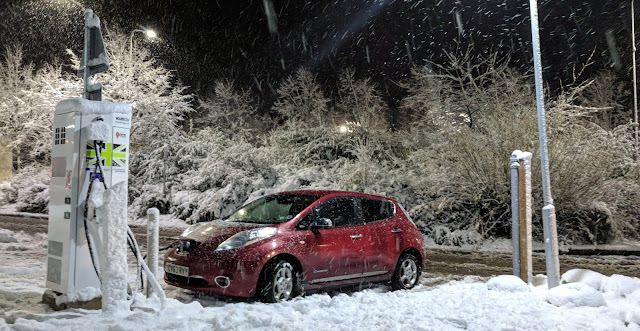 et Randonnée les gronde Traversées de 2 jour. .. 7 .... 15 jours. .